Yuantong Pagoda is located in the north of Kunming, close to Green Lake Park, this large Pagoda was built over 1,000 years ago when Yunnan was part of the Nanzhao kingdom and independent from next door Tang dynasty China. 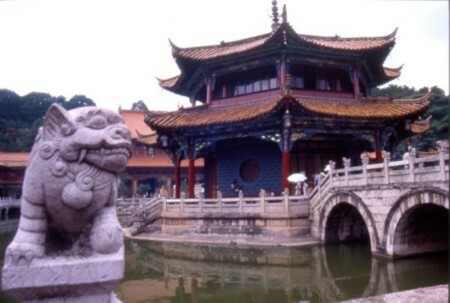 The temple complex and gardens are grouped around the Octagonal Pavilion at the center of a large square pond linked by bridges and walkways. Other temples in the complex include the Great Hall of Buddha and a Thai style temple, which was a gift from the King of Thailand. Throughout the year Yuontong Temple’s extensive gardens are filled with colorful flowers and blossoms.